The son of a ‘car dealer' (as they were once known) he felt that the passed down passion should be reciprocated. In 2004, for his father’s 60th birthday, he presented dad with a 1969 MGB GT which is still in the family today. 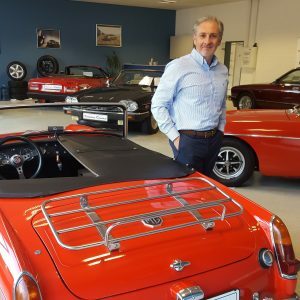 All the vehicles offered by Cathedral-Classics are personally checked, fastidiously inspected and driven by us to ensure they meet the incredibly high standards that are becoming very hard to find. The cars are selected with the ultimate aim of providing the new owner with the best possible experience of that model, whatever it may be. We pride ourselves in offering only the very best from these Legendary Marques. Prestige Vehicles deserve to be treated with all the integrity in the world - as do every one of our customers - guaranteeing, that the cars we have on offer are of the highest quality. So, whether it’s a so called ‘Oldtimer’ or indeed a ‘Youngtimer’ we would be delighted to hear from you. Naturally we can offer competitive European transportation through our colleagues at European Auto Services LTD in Canterbury Kent.